We touched down in Penang not much more than an hour from our departure. An easy flight, but one that took us back in time slightly. We had flown to another version of Southeast Asia, perhaps the more prevalent version, one where history’s scars are still visible, but new progress continues. A mix of abandoned buildings, lively art and new construction, all with the slap-dash sort of feel that I’ve already associated with Malaysia. Perhaps that’s unfair. But my impression the country north of us1and, to be geographically complete, to the south & east as well, in Malaysian Borneo. is a feeling of “it’s good enough” in most things. From what I saw of Penang, there’s a definite feeling of three worlds – not colliding – but rather coming to a gentle rest with each other. There’s the history – the temples and the colonial buildings left by the British. Penang commands a natural harbor within the Straits of Malacca, and the British were able to recognize and utilize the site as a base of operations and a fort from where His Majesty’s naval power was likely ever present and visible. There’s the history of the Chinese settlers that played such a major part in the island’s development, and whose presence is most visible in the ornate clan houses, temples and jetties that they’ve constructed within George Town (the capital & main city of Penang Island.) Among these two great powers’ influence on the island, is a multi-racial group of people that exhibit a joy of life, happy to live life on a beautiful island, which likely lends towards the laid back attitude that I saw, and eventually enjoyed sharing. I have to start with the street food of George Town. The food we had there was amazing – Char Kway Teow2noodles, sprouts and cockles stir-fried in lard, Prawn Mee3yellow noodles in a red prawn sauce, and Malaysia’s most famous food, satay4grilled meat on a stick, boyo! – what we found just around the corner from our hotel for four to five ringgit5about $1.40 USD a plate was far better than any that we’ve found yet in Singapore. Unfortunately, we arrived during the Islam holy month of Ramadan, which is marked by ritual fasting from sun up to sun down. Many of the street hawkers were closed during the day, but we found plenty of Indian hawkers in the “Little India” part of town, opening fresh coconuts to help beat the oppressive heat and humidity, and we found plenty of Chinese bakeries pumping out savory pastries. Street vendors also hawked souvenirs, which we should have bought a few to put some more money into the local economy, but not wanting to cart stuff around, and more to the point, not wanting to stand in the heat and haggle, we wondered on, Bev & I, in search of art and temples. Georgetown is also well known for it’s street art as well. Over the last few years, an explosion of street art has made its way to the walls of George Town, and now, many buildings in town, while not having been maintained, now adorn paintings of children on bikes, 3-meter tall cats or minions. Along with the paintings, are a series of wrought-metal scenes describing a bit of the local history for a particular street. I mentioned abandoned buildings. Our first impression of Penang, as we rode in the back seat of a rickety taxi, was a bit of curious wonder at fallen buildings, fields empty save only for debris and old tires and shacks with only haste to commend their construction. This is the contrast within Penang – across the street from such sights is a 65-story tower, Komtar, from which we were able to climb via a security-operated lift and see the entire city, in fact, most of the island, and mainland Malaysia as well. Bev & I sat and had drinks as the sun set, beating the crowds, perhaps, as we were the only two customers in the “cigar bar” on the 60th floor. Kek Lok Si from the street level. At night, Georgetown becomes a vibrant city. Maybe it’s because of Ramadan, but we found the city seemed to lag a bit in the final hours of the afternoon. I imagine that anyone becomes sluggish after not eating lunch in 31 degree heat. The final day of our trip, we had only the morning to go explore. 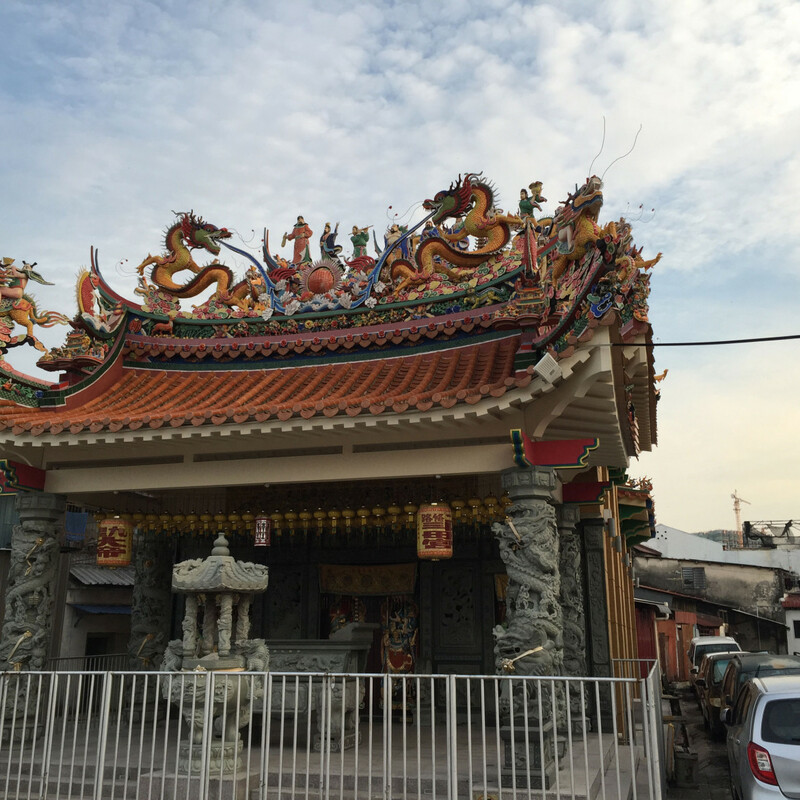 Having seen Kek Lok Si Temple dominate the southern neighborhood of Air Itam, we knew that was our final destination. The massive Buddhist complex features a massive pagoda that apparently includes Chinese, Thai and Burmese elements, and Bev & I found ourselves climbing the 30 meter high structure, sweat pouring out of our bodies. I’m not sure if I found enlightenment among the “Thousand Buddhas”, but if sweat is enlightenment, then yes, I was one enlightened mother fucker. Our trip up to the temple was interesting. We went without maps and took a city bus to a stop we figured was close enough. We walked up a residential street towards the temple but found only dead ends. Deciding that we apparently had to walk around this neighborhood, we started back down the hill. On impulse, I asked a woman roughly about my age if she knew the right way to the temple. “Sure, sure” was the reply and she started up the hill we had just come from. She pointed along a barely visible path between a few houses and nodded enthusiastically. Unsure but now unable to turn back, I tepidly stepped through someone’s yard as a toothless and shirtless uncle pointed right and said “Kek Lok Si, Kek Lok Si.” We soon found our way on a shaded tunnel of a pathway that wormed its way up to the temple. Shame burned for a few moments – my first thoughts of what outcome I was going to meet were not favorable. A few random notes – how amazing was it for me to wake up Saturday morning, turn on the wifi on my phone and have it blow UP with messages regarding the SCOTUS decision regarding marriage equality? As amazing as this trip was, it was made all the much better in my mind as I buzzed from the news. I am so proud of my country and of all the people that fought to make this happen. We’re not done, but this was a major victory.